It was discovered in the icy wastes of The Dakotas, when Skotte was age 9. The hilt is a bike handle, and the blade is a thick broomstick. It recieved improvements, like the black paint, and black duct tape for strength. His sister crafted a stylish sash and sheath to carry it (which is sadly lost to the ages). The sword saw a great deal of use, as Skotte would ride his fiery steed — a Huffy 10 speed dirt bike — traveling all across the lands on epic conquests, through hill and dale, forest and stream. With a trashcan lid for a shield, Skotte could take on any adversary (though his dad didn’t like him to beat up the trashcan lids, so Skotte mostly became good at dodge-and-parry tactics). 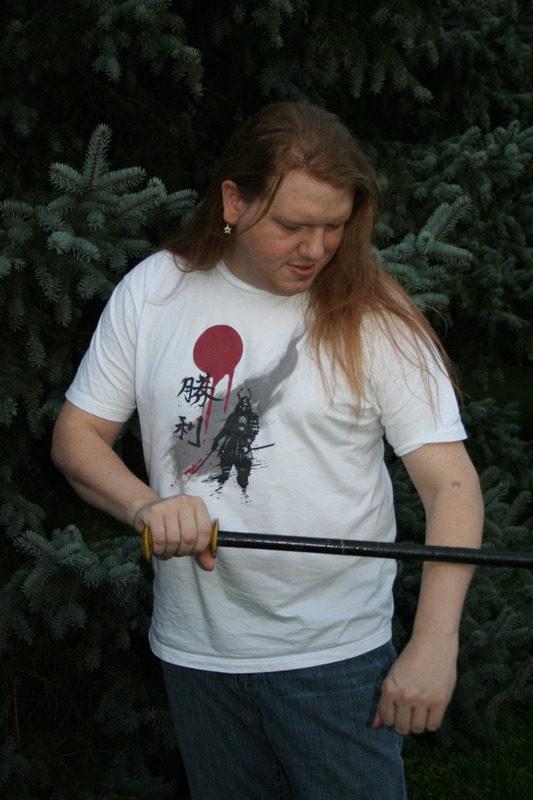 Some time ago, Skotte stopped carrying around wooden swords, preferring to wield them in stories and games. But the sword still holds a place of honor in our house. The name of the shirt is Shouri, from Ript. It is Japanese, for Victory.